Bathroom mirrors are such an important part of any bathroom design. They are functional, practical and can be used as an art piece of to enhance the space highlighting a feature or bouncing natural light throughout the space. Plain bathroom mirrors are a top choice because of their simplicity. There are no bells and whistles, making them the perfect choice for minimalistic bathroom designs. They work well in any bathroom from the ultra-modern to the more traditional style. Many of us have our dream bathroom in mind before renovations start taking place. You’ve taken ideas from the glossy magazines you have seen and with the right imagination and bathroom products, there is no reason you can’t turn your bathroom into your dream oasis. The bathroom mirror plays a very important role in the bathroom design. Many homeowners don’t consider the functionality of the mirror and just grab the first one they see, but you want your mirror to enhance the space and if you are unsure which mirror does this, keep it simple and use plain bathroom mirrors that offer you the functionality, practicality and style you are looking for. Natural light is something we don’t all have the advantage of in our bathroom areas, but by placing the plain bathroom mirrors with care we are able to take advantage of that light. The mirror will bounce any natural light into the room making it feel lighter, brighter and more spacious. Deciding where to place your mirror is one thing, but choosing the right size plain bathroom mirrors is just as important. As you can imagine a large bathroom with a small mirror is going to look wrong as is a small bathroom with a huge mirror. Measure the wall space and then choose your plain bathroom mirrors according to the size you have available and the shape and design that enhances your overall design. Plain bathroom mirrors are not just about offering you the ability to bounce light into the room or enhance a feature in the bathroom. These mirrors offer good reflection for getting ready in the mornings. When placed correctly they are a huge convenience in any bathroom design. While the design and size of the plain bathroom mirrors are important, you need to always remember these are functional items that can shave minutes off your time when getting ready in the mornings. When it comes to choosing bathroom mirrors there is no shortage to choose from. My personal favourite is the bathroom mirrors with lights which come in a choice of shapes and sizes, offers a host of benefits and blends in with any bathroom design. 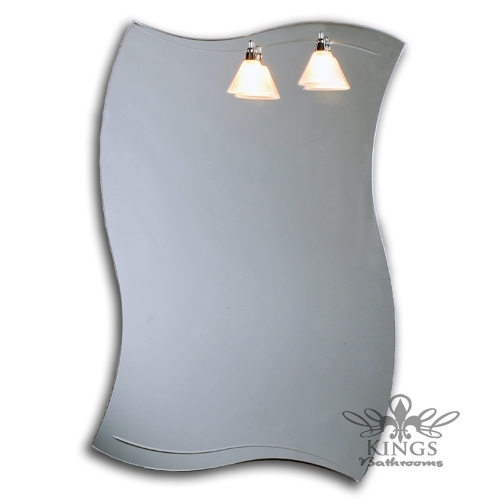 Mirrors are essential in any bathroom offering practicality, functionality and as an art piece on the wall. These bathroom mirrors with lights will complement any bathroom, big or small. They offer superior reflection enabling you to get ready while shaving minutes off your time, a great advantage for the mornings when you’re trying to get the whole family ready for work and school. The extra lighting also ensures you have a clear reflection even in the darkest of bathrooms. Light is so essential in any bathroom, light helps the bathroom feel brighter and in turn this makes it feel more spacious. Lightly coloured walls, light bathroom accessories and an abundance of light is a recipe for success. Unfortunately we don’t all have the advantage of abundant light in our bathrooms, we can’t all have huge windows that catch all the sunlight, even though it would be a dream come true, which is why need to find other ways to add light to the bathroom space. Bathroom mirrors with light add that extra bit of light we need. With careful positioning the mirror can reflect any natural light coming into the bathroom, immediately brightening the room and in the evenings you can put on the lights of the mirror for that extra glow. What I really love about the bathroom mirrors with lights is the choice of shapes and sizes available from oval to square. There is a design to blend in with your bathroom whether you have chosen a modern minimalistic design or a more traditional feel. It’s important you pay careful attention to your bathroom products and fixtures and fittings when choosing bathroom mirrors with lights, you want your new mirror to enhance the space and blend in with your existing features. This being said, if you have chosen plenty of straight edges, choose bathroom mirrors with lights in a square or rectangular design. If you have chosen round, oval or gentle curves, keep the design flowing by choosing round or oval bathroom mirrors with lights to help compliment your bathroom design. Your bathroom can be a stunning space if you incorporate accessories. It’s all well having a beautiful bathrooms finished with stunning bathroom products that turn the space into a modern oasis, but without accessories it will be boring and wont’ be functional or practical. The first of the bathroom accessories you’ll want to consider is bathroom mirrors. Mirrors play a vital role in the bathroom design. They can be used to enhance light in the bathroom space or they can be used to highlight a centre piece making it a focal point, such as that stunning freestanding bath you have just placed in the room. Basic accessories such as toilet roll holders, tumbler holders and soap dishes are also essential in ensuring your bathroom is functional. The cone bathroom accessories are a great choice for either modern or traditional designs with a cylindrical finish that can blend into your design with perfection. Towel rails and rings are also so important in any bathroom design. They help reduce clutter while ensuring that you can easily identify your hand towels from your bath towels. The last thing you want is guests drying their hands on your bath towel and I’m sure your guests won’t want to dry their hands on a towel you have used to dry your body. The towel rails and rings are also available as part of the cone bathroom accessories range, so you can ensure all your bathroom accessories are the same, blending in beautifully together and enhancing the space. New towels are an affordable item that you can use to brighten up your bathroom area. Brightly coloured towels are a welcome addition to an all-white bathroom area. Hanging these new towels on your towel rails which are part of the cone accessories range is affordable, practical and stylish. Another essential accessory for the bathroom is a blind. You can choose from a range of blinds available on the market, personally I prefer blinds with a bit of colour which adds to the personality of your bathroom space. Set yourself a budget before you start shopping around. You’ll be amazed how you can accessorise your bathroom without breaking the bank, turning it into a stylish, practical and functional space. Mirrors play such an important role in the bathroom design offering functionality, convenience and style. There are so many great mirror options available, but one of my firm favourites are the infinity bathroom mirrors. If you’re designing your bathroom to be modern, unique and sophisticated, these “space aged” bathroom mirrors can add that “wow” factor to the space and will easily become the centre piece of your design. Infinity bathroom mirrors are a normal mirror which you can use when getting ready for work and place in an area where they reflect the natural light into the space. As it becomes evening and the sun light disappears, you can turn on the lights of your infinity bathroom mirror to make a stunning additional light source. The lights of the infinity bathroom mirrors seem to disappear into the mirror, making the lights look like they are vanishing into a tunnel or worm hole, so to speak. The advantage is that they add that glamour and style to any bathroom design while offering a warm and ambient light during the night time. You’re probably wondering why you would choose infinity bathroom mirrors over a normal bathroom mirror and the answer is simple. These mirrors offer you all the advantages you would get with a normal mirror, you can use them to see your reflection, they become a masterpiece on what would be a bland wall and you can position them to highlight a centrepiece in the bathroom or to reflect the natural light into the space during the day. At night when you switch on the infinity bathroom mirrors is when they come into their own, giving a wonderful coloured glow into the space that makes them such an appealing choice for all bathroom designs, both modern and traditional. If you’re looking for a way to add “wow” factor to your bathroom, you are looking for a mirror that will become the centrepiece of the bathroom and will offer you all the advantages and functionality you would get from a normal bathroom mirror, then the infinity bathroom mirrors are definitely the right choice for you. The blue light is my favourite which gives a warm blue glow to the bathroom at night. If you have chosen white bathroom products, the blue light of the infinity bathroom mirror reflects off the white surfaces giving the bathroom additional light that is cool and sophisticated. Bathroom mirrors are essential in any bathroom, they offer a host of benefits and make a bland wall into a masterpiece. When working with a modern bathroom design where you want to keep everything minimalistic, plain bathroom mirrors are the ideal choice. Plain bathroom mirrors are what they are, plain, minimalist and stylish. These mirrors work beautifully in any ultra modern or modern bathroom design as they are available in a range of shapes and sizes to compliment your bathroom space. When you think of plain bathroom mirrors you probably have a plain rectangular mirror design in mind. You’ll be amazed at the great shapes available to compliment any bathroom space. If you have chosen straight edges throughout your bathroom with rectangular or square fixtures and fittings, then I do suggest a rectangular mirror. But if you have gentle curves, round or oval fixtures and fittings you can choose from oval plain bathroom mirrors to the etched designed mirror, which is rectangular in shape being wider at the top than the bottom with gentle curved edges to fit in with your design with ease. It is so important that you choose the right size when looking at plain bathroom mirrors. A small mirror in a large bathroom will look completely out of place as will a large mirror in a smaller or compact bathroom. Measure your wall, determine the right sized mirror before you start looking at the shapes available. You can find plain bathroom mirrors in sizes from 60cm right up to 100cm. What you may not realise is how important the placement of plain bathroom mirrors are to the bathroom design. Mirror reflect light and in a modern bathroom you want to achieve a light and bright space. See how the light flows through your bathroom during the day and then mount your plain bathroom mirror where it will reflect the most light, your mirror will bounce the light into the space giving your bathroom a spacious, light and bright feel automatically. You’ll also want to ensure that you place the mirror in a convenient space. While your bathroom may get the most amount of light in the far corner, you should choose a wall close to the basin that benefits from light. This way you benefit from the light and practicality in one easy step.